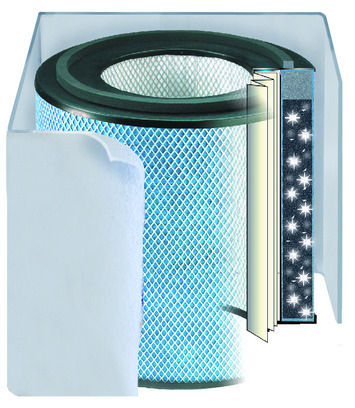 This is the replacement FR-200 filter cartridge for the Austin Healthmate Junior Indoor Air Cleaner, that includes both carbon and HEPA replacement filters, that lasts up to 5 years and also fits other Junior Series air purifiers. This is the Replacement Filter for the Austin Air HealthMate Junior Air Purifier (Part # FR200) Recommended change interval is 3-5 years, depending on concentrations of pollutants. Replace every 2 years to be safe. The Austin Air HealthMate Junior Filter (FR200) features a true medical-grade High Efficiency Particulate Arresting (HEPA) filter surrounded by a 6 lb Carbon/Zeolite mixture designed to effectively remove / absorb chemicals, and gases. The HealthMate Junior Filter uses the HEPA layer to remove up to 99.97 percent of all particles down to 0.3 microns in size and 95 percent down to 0.1 micron. Includes the Pre-Filter-just specify what color below--white or black.